The subject of the doctorate training program is in the field of fine art, including painting, sculpture, graphics, graphic design, intermedia, as well as stage and costume design, and restoration. The objective of the doctorate program is to obtain a Doctor of Liberal Arts degree. 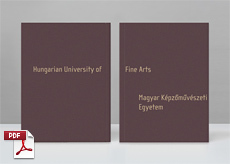 The Hungarian Fine Arts University Doctoral School offers an 8 semester curriculum. On completion of the first 2 years, they have to take a “complex exam” and in the next 3 years complete the final doctoral dissertation and art project in order to receive the DLA diploma. The student’s supervisor follows the student‘s work, offering regular consultations. The students report on their artistic and research project every 6 months as well as an evaluation of the lecturing program in the Doctoral School. The student must apply for a joint theoretical and practical program. The applicant has to have a portfolio about his or her artistic practise and obtained MA diploma. The applicants have to prove that they are confident enough in their artistic practise. The applicant also has to have an intermediate level language diploma. The applicant must select a doctoral research topic which is announced by the tutor/supervisor. During the presentation exercises each student presents his or her artistic activity from the beginning to the actual situation. The main purpose of the program is to develop the students’ presentation skill, to get to know each other artistic activity and research topics, to follow each other’s progress during the 4 years of doctorate studies. In every semester the students have to give a short lecture in front of their supervisor and the other students about their last semester’s activity. 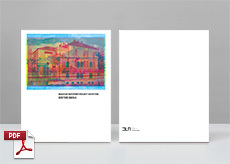 The aim of the program is to follow the actual state of the contemporary art screen. In every one or two academic year the Doctoral School organizes exhibition for the students, occasionally in collaboration with international partners. H-1062 Budapest, Andrássy út 69-71.